Henrik Stenson came into Sunday as the heavy favourite to win the DP World Tour Championship, and he didn’t disappoint with a final round 64 to win the DP World Tour Championship and the Race to Dubai. Looking at the final leaderboard, you’d think that Stenson just cruised to a victory in Dubai, but that really wasn’t the case heading into Sunday. Stenson’s lead was only one over France’s Victor Dubuisson, who was on a good run after his win last week at the Turkish Airlines Open, and there were enough big names on the leaderboard, including Ian Poulter, Rory McIlroy and Lee Westwood that were ready to pounce if Stenson faltered slightly. That didn’t even come close to happening though, as Stenson started hot with four birdies on the front nine to go out in 32, extending his lead to three over Dubuisson after he made bogey on the par-4 8th. Dubuisson’s inconsistent play continued on the back nine, as he went bogey-birdie-bogey on the first three holes, allowing Stenson to extend his lead further. Poulter was making a charge as well, but at this point, he was too far back to really put up any kind of fight. His 66 on the final day was bested only by Stenson, who made eagle at the last after nearly holing out from the fairway for an albatross from over 250 yards out. After the tap-in eagle, Stenson had won the tournament by six over Poulter and claimed not only the DP World Tour Championship win, but the Race to Dubai as well. Is he the best player in the world? No, that’s still Tiger Woods, but Stenson is playing better golf than anyone, without question. His 2013 season is right up there with Tiger too, and it’s been better than Phil Mickelson’s, despite what many of the American golf writers will have you believe. That European Ryder Cup team is looking better and better every day. That’s Poulter’s caddie, Terry Mundy. Poulter has been on a hell of a run lately, and some are asking why he can’t do this on a more regular basis. The only answer I have for that is that golf is a weird game, and sometimes you can look like the best player in the world and at others, you look like you have no idea what you’re doing out there. Nobody embodies that more than Poulter, and maybe his bet with Stenson allowed him to get up for the last few tournaments, but you’d certainly like to see him play better on a more regular basis. Golf is just better with him in it at a high level. It hasn’t been the best of years for the three guys above, but having them tied for fifth in this event will make all of them feel good. There’s been some thought, not from this site mind you, that one or more of these guys wouldn’t be apart of the European Ryder Cup team in a few months. That seems like a bit of a twitch reaction to substandard seasons, especially from the European side of things where they are usually a little more accepting of poor form in the selection process. Westwood’s been through that in the past, as has Sergio Garcia and others. I still think all three will be at Gleneagles in September. Other notable finishes: Jamie Donaldson and Miguel Angel Jimenez (T8), Peter Hanson and Justin Rose (T10), Francesco Molinari (13th), Graeme McDowell and Thorbjorn Olesen (T17), Martin Kaymer (T19), Matteo Manassero (T21), Louis Oosthuizen (T32). Speaking of the European Ryder Cup team, it’ll be interesting to see if Dubuisson can crack the list and he certainly is playing like he deserves to be there right now. If he could make the team, he’d be only the third Frenchman to play in the Ryder Cup after Jean van de Velde in 1999 and Thomas Levet in 2004. 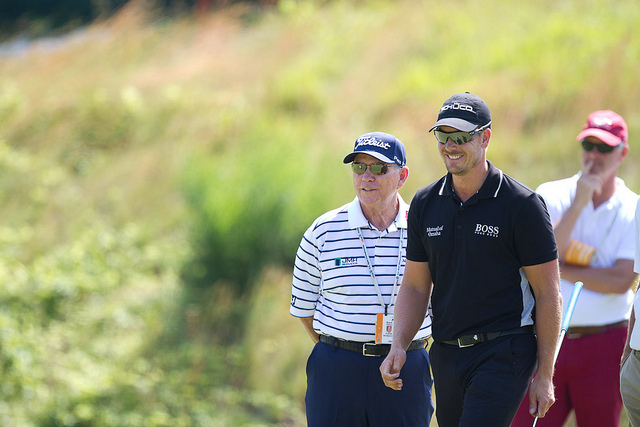 How good was Stenson this week? He missed four greens in regulation over the entire tournament. ← Royal Portrush to get first international major?